If you are a regular library patron, chances are you have met Helen Dewey. Helen was elected to the Library Board two years ago, and by default she immediately became the library’s “accidental techie.” She has volunteered countless hours installing computers, setting up software, and monitoring them on a regular basis, saving the library hundreds of dollars in tech help. Helen grew up in New Jersey, earned a Master of Library Science at the University of Maryland, as a Navy wife lived in Rhode Island, Florida, Ohio and Virginia. Prior to moving to Michigan she had worked almost 20 years as an Information Services Librarian in the Fairfax County (VA) Public Library system. She and husband, Roger, moved here permanently ten years ago. Their 2 daughters live in Kansas and Virginia. Problems with eyesight are a bane though they only make enjoying her many interests more challenging. 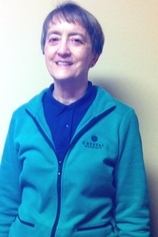 Beside volunteer work, Helen enjoys reading, family history, watching hockey (Go Wings! ), kayaking, and bicycling. She has greatly enjoyed several family trips to Sweden.